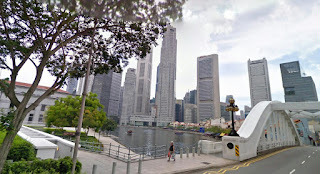 Pictures are from Google StreetView. NOTE: Singapore is in the tropics, and the climate is very muggy: expect high humidity, so try to run in the mornings, when the air is coolest. We'll start this short jogging route in the heart of town, on the river at Bridge Street, just like the Singapore Sights Route. This is my favorite spot in town: with parliament presiding quietly on one side, and the bum boats bobbing in front of the line of pubs along the other side. This stretch of river is just inviting you to a pleasant waterside Singapore evening. This route is a 3-kilometer loop to the south, through Chinatown. Why a city that is three-fourths Chinese has a neighborhood called "Chinatown" is beyond my comprehension (I suppose it was coined in the colonial days), but it's a colorful neighborhood, and well worth seeing. It's amazing to think that the Chinese were originally imported by the British as coolies to do the hard work in the harbor, and that they soon turned the city into one of the world's economic powerhouses. So, off we go, running south on South Bridge Road. After a few blocks, you'll cross Mosque Street and see the old Jamae Mosque on your right. Then, one block later, you'll come to the Sri Mariamman Hindu temple, at Temple Street, naturally. Then, one block after that, you'll come to a pagoda-like Buddhist shrine on your right, which holds what is thought to be one of Buddha's teeth. One block after the temple, Bridge Road splits into Neil Road and Maxwell Road. Keep running on the smaller street that goes straight ahead, Tanjong Pagar Road. When you get to Wallich Street, in 2 blocks, turn left and run until the street ends at Maxwell Road. 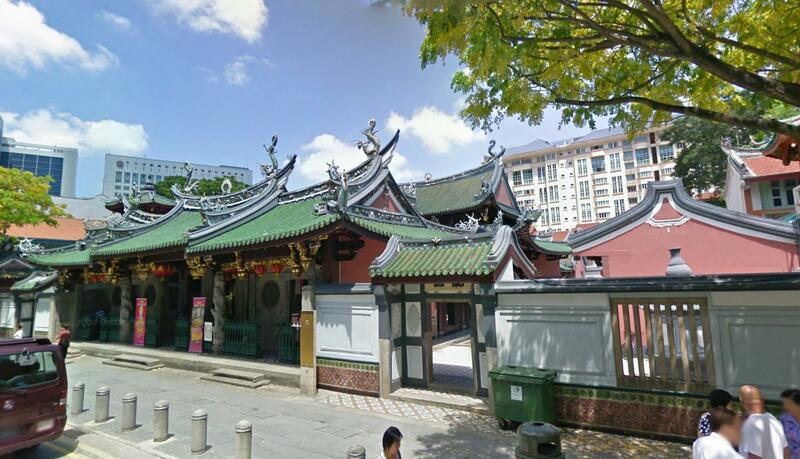 Cross Maxwell and run through the little park that angles up along Telok Ayer Street. The street curves to the right and after 2 blocks passes the ornate Thian Hock Keng Taoist temple on your left. Now you just run straight for the last few blocks to the downtown bank buildings on Chulia Street. You can run straight past them to the water side of the buildings, then turn left and you find yourself among all the pubs and restaurants at Boat Quay again. In one more block you'll be at the Bridge Road bridge again.